A full size map on an 8.5 by 11 inch page can be had by clicking on the above map. Before getting into the 1999 description, between 1999 and 2002 the Colorado Forteeners did maintainance on the trail and moved it. The blue route is more or less the 1999 route and the red is as of 2002. Note that from the "trail jct" on up the route is slightly to the south. It is now on skree and on a compound slope, making this a much more difficult hike. I am not impressed with what was done and will not support this group. The waypoint file for this hike is quandary.wpt. Right click on the link and save the file. 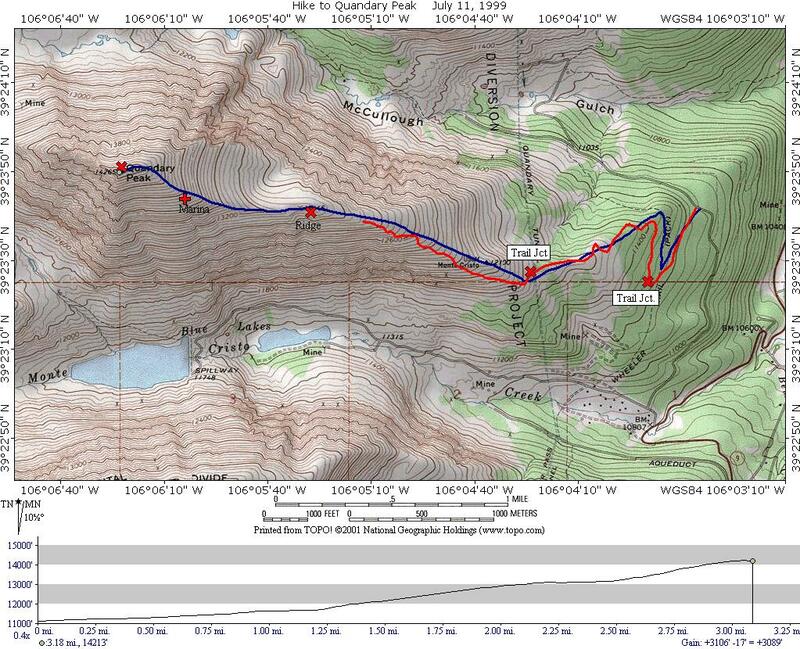 The image of the route from the GPS is here. Before and after the hike, I took some pictures of Quandary from Colorado 9. First from the south side of the mountain, then second from the east-north-east side. On this hike, our neighbor John Drake joined Marina, myself, and our two huskies Athena and Minerva. This was to be our first attempt at a peak over 14,000 feet. As the maps and trail guides indicated no water on this trip, Marina and I loaded ourselves up with more water than usual. I carried close to 3 quarts, which was too much. We also had the dogs carry over a quart each as well. All of us had water left after the hike was over. We were correct in assuming no water during the hike, although the summit did have snow which the dogs ate. The hike from the east side has two possible starting points. One on County Highway 850, which is not marked on any maps I have seen, and one on County Highway 851, which is marked on the maps. The 851 trail starts higher up, and the climb to the merge point is not as steep. To reach the trail heads, drive south out of Breckenridge past the "town" of Blue River. As you start the hairpin turns which take you to Hoosier Pass, a dirt road will appear on your right called Blue River, and the county road number 850 will be on the sign as well. Take this road. Almost immediately on your right will be County Road 851. Take this right as well. After driving a little over a mile, on your left will appear a jeep road and a sign indicating the Quandary trail head. Most likely cars will be parked here, unless you are really early on either a weekday or weekend. As we were climbing up, we stopped to talk to the first person on their way down, and he stated he left the trail head at 5:45 am. For this early start, he had the climb up to himself and saw a mountain goat near the summit. We left the car at a more civilized 8:15 in the morning. We did not have to park too far from the trail head, only 3 car lengths. I suspect that later in the morning it was much worse. As usual we were among the slowest on the hike. The hike was crowded, but not unpleasantly so. Once above tree-line, there were always people in sight. The maps indicate that from the 851 trail head, you will hike southwest for a short way, then turn north as you join the Wheeler National Recreation Trail. After another short way on this, you turn back to a southwesterly direction and leave the trail. The first part of the hike up to the Wheeler is a jeep road. When we reached Wheeler trail, we found another jeep road forming a 4-way intersection. There was a sign posted with an arrow on it indicating you should turn right at this intersection. However, when we reached the point where the trail leaves the Wheeler, what we found was that the jeep road did a hairpin turn to the left, and just a small footpath continued on straight. I guess that the Wheeler is not a well used trail, despite the "National" in its name. This first part of the hike is through a forest mostly of spruce, with a little fir mixed in. There very little pine, probably due to the fact that the start of the hike is already over 11,000 feet. The climb at this point is very gentle. After leaving the Wheeler, you will enter an area of meadow and spruce, then do a slight descent back into denser forest, and then climb back out. In the meadow area, you may be able to catch a glimpse of the last false summit above you. As you leave the forest for small timberline type growth, the 850 trail joins you from your left. At this point if you look at your topographic maps, you are more or less over the Quandary Tunnel. This appears to be part of a water diversion project from the Pacific side to the Atlantic side. You won't see any evidence of the tunnel here, however. The easy part of the hike is now over. From this point on, the trail does not make any compromises with the slope of the mountain. It will basically go straight up (and down) the fall line. The terrain for the next mile or so is like a giant stairway, the slope increasing then decreasing over and over again. Sometimes during this part the summit will be visible, and other times it won't. During this portion, the land around you is high tundra. The trail narrows from its jeep road width to footpath width. As you go higher, it becomes more and more rocky. About 100 yard before the USGS 13146 foot benchmark (on the topos) the trail disappears completely and you have to negotiate a boulder field. Marina, John and the dogs thought this the most difficult part of the hike. I disagreed, as I thought the loose rock later on was more difficult and treacherous. Upon clearing this boulder field, you come to a large cairn, and a long ridge which is relatively level. You can see your way clear to the last false summit at this point (the true summit is maybe only 20 feet higher than this false summit along a ridge running more or less to the west). The trail becomes visible again. However, don't get lulled into a sense of ease. As soon as the slope becomes steep, the trail disappears, basically for good. The rest of the hike is treacherous. On your left (south) is a very steep slope which goes down the valley where the Blue River has its origins. There are two reservoirs plainly visible. I did not want to get too close to the edge for this, if you fall over the edge, it could be life threatening, it has taken lives in the past. On your right, the slope is more gentle, revealing a nice bowl. We could not hike to the right, however, as there was still a good deal of snow. The trail follows the spine of the ridge all the way up. The spine is at most 10 feet wide, so care is called for. Here are some pictures taken on the ascent. In the valley on the south side is a reservoir (Blue Lakes? ), and looking on the east side of the same valley. Now looking up at the ascent, John and Marina can be seen. When we reached about 13,700 feet, Marina and I dropped our packs. No one was going to take anything this far up, and continued onwards. Marina, however, was feeling the altitude and did not want to take chances so she stopped at the place I waypointed as Marina. Marina took some pictures of the ridge to be hiked.John Drake, carrying a lighter load, and being in better shape had gone on ahead, out of sight by this time. I continued on very slowly with the dogs. It took me another 50 minutes to do the last part of the climb, and I was feeling somewhat lightheaded. I consider this last part of the trail the most difficult as the rock size was very small, 3 to 6 inches and very loose. On the boulder field I mentioned earlier, the boulders were quite large and flat and I could get good footing. I met John at the top. It was unfortunately a somewhat hazy day, so the views were not quite what I had hoped for. I am sure that I saw Mount Elbert and Mount Massive to the southwest, as well as many other mountains. Looking down into the valley on the north side of the mountain, I saw a lake which was still frozen. The topo's also indicate a small glacier in this valley. The weather was starting to close in, so I spent only 5 minutes up top, taking some pictures. I did not sign the log book up there. While resting, Marina took some pictures of flowers. This shows that despite the nasty appearance of the scree, life does have a hold. John and I started down, making the best speed we could, but being extremely careful. We re-joined Marina and put our packs back on and continued down, keeping an eye on the weather. At 2:50, the rain, hail and one thunder stroke hit. We were still well above tree-line, but below the boulder field. Because of the weather, I did not keep a careful log of the times at each point on the way back down. My understanding from talking to other people on the trail that day, is that each of the Fourteeners is going to be loose rock as you approach the summit. Time will tell how many Fourteeners we do. A side note on this hike, a Great Pyrenees dog walked up the trail with the crowd. This dog, Mesa, was not accompanied by his owner. We called the number on his tag and were told that he does this hike by himself all the time by himself. At the top of the mountain, we heard a Pika, and Mesa showed no interest in chasing it. He just wanted to be with people. Back to Snowedunder's home page.